I'm Looking For Something Comfortable And Quirky But Not Too Flashy! What Car Should I Buy? Filed to: What Car Should You Buy?Filed to: What Car Should You Buy? What Car Should You Buy? 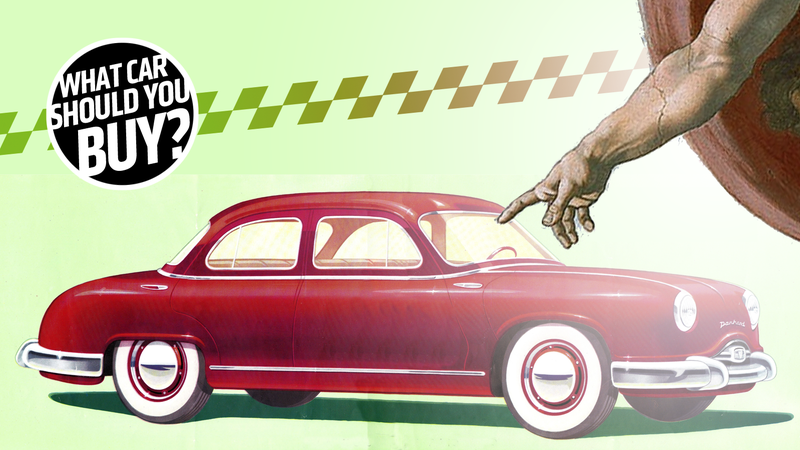 What Car Should You BuyThe experts at Jalopnik answer your car-buying questions. Nic is a priest who does the Lord’s work by making house calls and shuttling parishioners around, but his big Ford truck isn’t quite suited for the job. He needs something professional, but a bit different and obviously affordable. What car should he buy? I am a priest. I have to visit parishioners at home, at the hospital, or even just out for lunch. Currently I drive a 2003 Ford F350 single cab, which was a hand me down, and it isn’t the best commuter vehicle (gas mileage, hard to park in the city, etc.). I am in search of a vehicle that I can make my short trips to visit folks in their various places or park at the church and not feel self-conscious about how it looks (I mean I’m pretty sure of myself but there is a certain professionalism that must be maintained), while still wanting something that is fun to drive, decently reliable, and has a bit of quirkiness to it, because the past few years of driving a big white pick up truck have me craving anything that’s not this boring. Well, Father Nic, if you are looking for something affordable and quirky you have obviously come to the right place. Now before my excellent colleagues tempt you with obscure right-hand-drive JDM imports or some 40-year-old shooting brake that had a production run of fewer than 100 units, I’ve got something for you that ticks all the boxes that you could reasonably buy and drive. What you need is a Saab. The Swedish marque is the epitome of “quirky luxury car.” Volvos aren’t that quirky anymore—they got too stylish and mainstream. But you gotta be a little bit weird to drive a Saab. Thankfully there is a lovely Saab dealer in your area keeping the dream alive with all kinds of interesting cars. But my recommendation would be the last Saab that ever made it to the States, the 9-5. This 2011 9-5 Turbo4 is a supremely comfortable, stylish, but very different midsize luxury sedan. You can cruise around and look cool without anyone thinking that you are ballin’ with the collection plate. While Saab parts aren’t super easy to find, I would imagine there are a few Swedish specialty shops in your area and many of major components were shared with other GM vehicles so it shouldn’t be too difficult to fix. This particular car is an automatic, but spread the net wide enough and you can enjoy some-three pedal Swedish goodness. I’m guessing that at some point in your extensive religious studies you must have come upon some reference to the Volvo Amazon God once owned, years ago. I think it’s in the bible, in Galifracians 16:10? Something like that. Maybe I’m wrong. Still, it doesn’t matter, because a lovely, classic Volvo 122 seems like exactly the right car for you. The Volvo Amazon/122 hits pretty much all of your criteria: quirky, fun to drive, reliable, manual, not too flashy—this car was pretty much designed for interesting college professors and people of the cloth such as yourself. This 1966 Volvo 122S is a particularly nice example, with only 77,000 original miles and an interior that’s like a perfect little time capsule. Since this is a 122S, that means you’re getting a second SU carb on that bulletproof B18 engine for a few extra power-meatballs. I used to have a Volvo P1800S with the same engine, and I can tell you these things are ironclad brutes, reliable and very easy and satisfying to wrench on, when it needs it, which, again, won’t be that often. The four-door body will make getting parishioners in and out easy, and I’m certain anyone you get on those wonderful corned beef-colored seats will be charmed into piety. This little jewel is even in your budget at $18,500, and that value is never going to drop for a car like this as long as you take care of it. This classic Volvo is what you’re seeking. I can feel it. You’re going to love it. Father Nic, I sympathize with your situation in some ways. While I’ve never been in the business of saving souls—and let’s all be thankful for that—I do know what it’s like to need to balance having a fun car with looking like a respectable citizen. For many years I wanted a Nissan 350Z, and I went to buy one when I got my first decent-paying big boy reporter job. But at the time I was covering the police department, and regularly going to crime scenes and such to talk with victims and their families, so I didn’t think the flashy Z was a good look for that. I went with a Subaru WRX instead, back before all of them started looking like STIs, and to most casual observers I had a responsible, subtle Subaru sedan rather than some ridiculous sports car. But it was fun when I needed it to be fun. These days WRXs have fully embraced their ridiculousness in the looks department, but it’s still a practical and enjoyable option. I may be able to do you one better: get a Honda Accord Coupe with a V6 and a stick. This model was recently discontinued, but it remains my favorite modern Accord. You get a healthy 278 horsepower from a beefy 3.5-liter V6 and one of the best manuals in the game, but to most everyone who sees it, you just drive an Accord! You can’t get more responsible and buttoned-down than that. Here’s one for $18,999. I’d say buy it and go with God, but I don’t have to tell you how to do that. Oh, Seattle: the land of a million sad rainy days and parking spaces the size of thimbles. While I’m all for embracing your inner old Ballard fart and going Swedish, perhaps those options aren’t small, new or fast enough for what you want. If you’re annoyed with how large the truck is, perhaps it’s time to embrace the subcompact life. You’ll marvel at all the tiny places it crams into, and find that modern super-small cars really hold more than you expect inside. The Ford Fiesta ST may just be exactly what you need. While it does have somewhat aggressive looks, when everything on the road is aggressive, nothing truly is. It’s an angry peanut that’s more bark than bite, and easy to toss around like a hooligan when the need arises. Plus, it comes in fun, bright colors. Who can stay mad when they look at a little neon green hatchback? If you’re lucky, you may still even be able to find a still-new 2017 model on the lot for under $20,000, like this example on Autotrader for $18,995. If not, there’s gently used ones all over the place in that price range, like this cheerful red-orange 2015 one on Autotrader for $17,771. For this is the day that the Lord has made—to hoon. I Need A Cheap Ride That Can Handle My Drum Set! What Car Should I Buy? I Want To Blow New Car Money On A Rad Ride From The &apos;80s Or &apos;90s! What Car Should I Buy? My Mom Needs Something Cheap And Fancy To Cram A V8 Into! What Car Should She Buy?